‘Life is a great adventure or nothing.” said Helen Keller, the first deaf-blind person in America to conquer her blindness to realize the great adventures of life and earn a Bachelor of Arts degree. But for most of the visually handicapped poor, life is ‘nothing’ because it affects them socially and economically on a daily basis. India has the largest blind population in the world – 8M people totally blind, 55M are visually impaired, 320K are children and 80% either preventable or curable. We at ATMECS have been at the forefront of supporting the cause of timely eye care to the doorsteps of rural India through our association with Sankara Eye Foundation. The association is part of our organization DNA in supporting the community causes and work towards eradication of blindness. 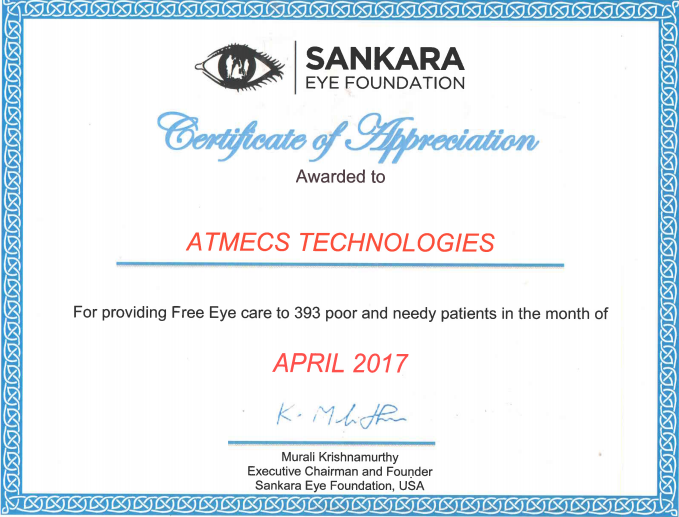 Apart from the corporate donations to support the cause, ATMECS takes pride in donating in the name of every employee of the organization. 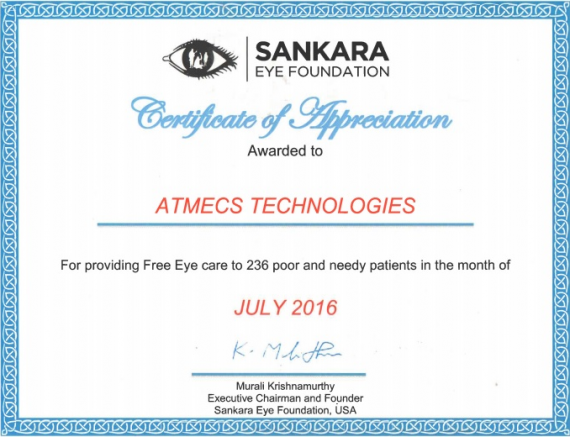 ATMECS sponsors eye operation on behalf of every new employee, who joins the organization. 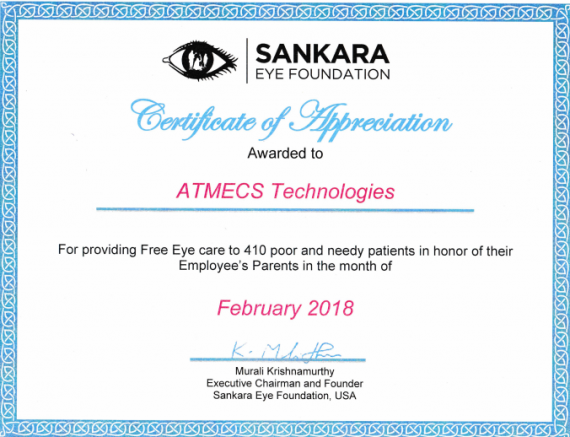 Sankara Eye Foundation, in turn provides a certificate of such donation in the name of the employee with the picture and details of the benefactor (Patient). 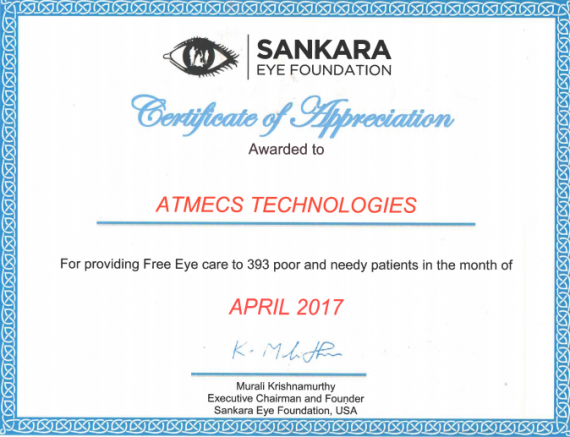 ATMECS considers this to be a strong way of motivating employees towards the cause as well as to support the cause of the needy. 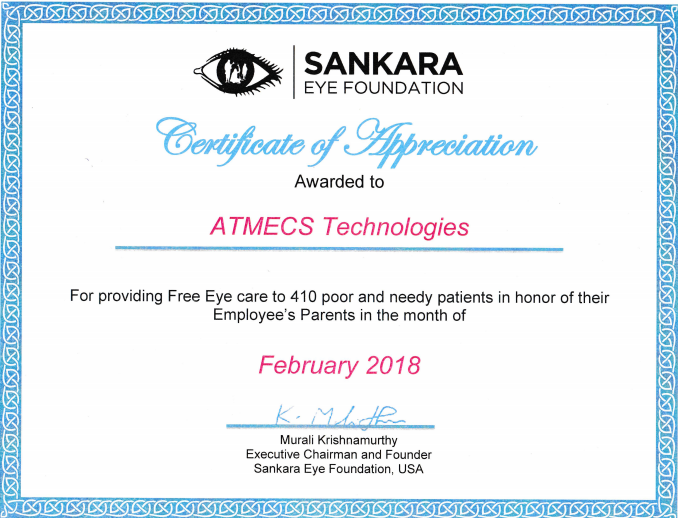 Sankara Eye Foundation (SEF), USA founded in 1998 by Mr. K. Muralidharan, Mr. K. Sridharan, and Mr. Khushnood Ahmad, is striving hard to eradicate curable blindness in India. SEF is registered as a non-profit under sec 501(c) (3) of the Internal Revenue Code.